It's no secret that the market for Android tablets is crowded – and getting more so every day. Just ask Samsung, Acer, HTC, Huawei, Lenovo, Pandigital and, oh yes, Verticool. We could keep going, but you get the point: it's a big market out there, one with wildly varying prices and features. 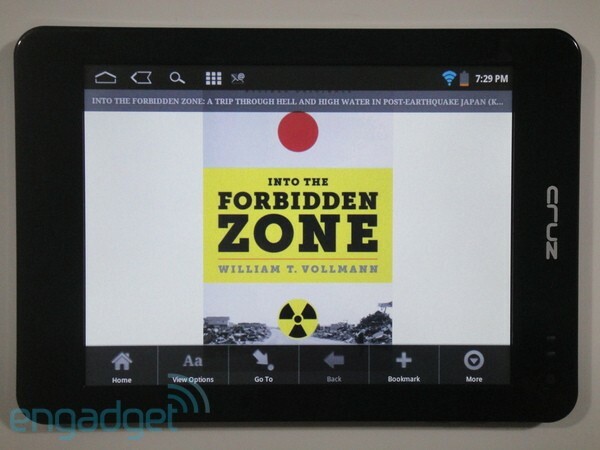 And just recently a little company called Amazon made its move in a big way with the Kindle Fire, an Android-powered $199 portal to its corner of the cloud. The world's largest online retailer clearly thinks competing on price is a way to stand out from the pack. Velocity Micro, maker of the 8-inch Cruz T408, wholeheartedly agrees. It's coming to market with a $199 slate, hoping to capture some attention of its own. Can it succeed? Read on to find out. Velocity Micro's 8-inch Cruz T408 tablet is inexpensive and solidly built, but for $199 you should expect some serious compromises -- namely, no Honeycomb or Android Market access. Inside the box you'll find a handy mini-USB cable (though if you're like us, you have dozens of these laying around), a power cord and a short user guide. 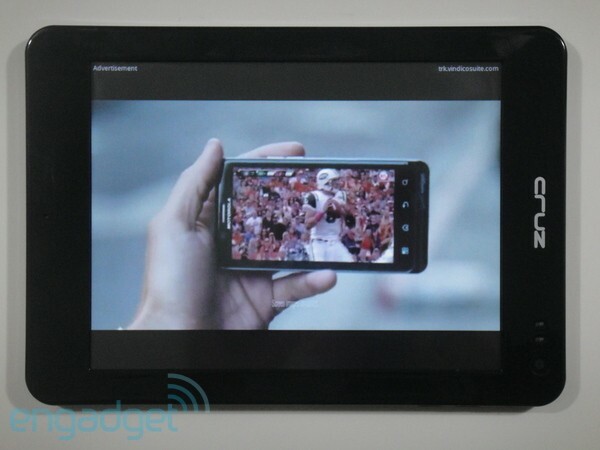 And then there's the actual tablet, measuring 8.5 x 6.5 inches, with a depth of just under half an inch. The touchscreen runs at 800 x 600, and feels exactly like what it is: plastic. If you're used to gliding your fingers over glass, the extra friction takes a little getting used to, but it feels solid to the touch, and the display doesn't warp or blemish. The case feels equally rigid, thanks to an aluminum chassis inside. The front is a glossy black that predictably highlights fingerprints, while the back has a matte, quasi-rubberized finish. On the whole, the T408 has the solid feel of a more premium tablet, not a cheap plastic thing that could go flying from your hands at any moment. The microSD, mini-USB and headphone connectors run along the top, while the power button and volume rockers are on the upper-right corner, adjacent to the front-facing VGA camera. The front-facing camera looks about as good as you'd expect for VGA. It's grainy and often underexposed, but adequate for Skype as long as you're in a well-lit room and don't need to convey complex emotions via facial expressions. That said, we'd be likely to turn off video during chats. 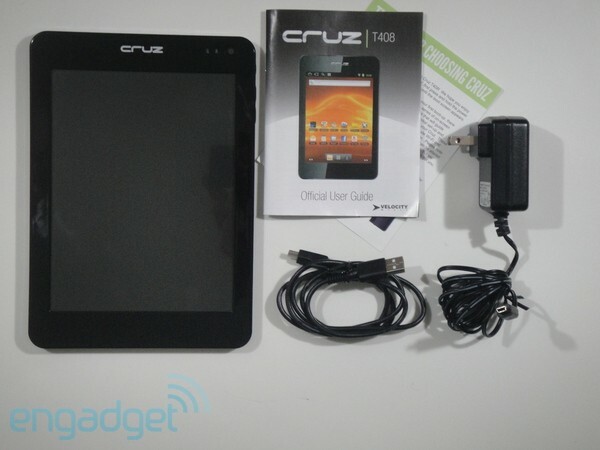 As with many inexpensive Android tablets (such as the $299, 8-inch Archos G9), the T408 forgoes a rear-facing camera. If Velocity Micro's looking to further bring down the price, we'd suggest ditching the front one as well. Under the hood lies a 1GHz Cortex A8 made by Samsung, alongside 512MB of RAM and 4GB of built-in storage. That's speedy enough to run the included copy of Angry Birds, and helped us surf the web fluidly. Flash-intensive sites posed no threat, partly thanks to a hardware-optimized, licensed version of Adobe's ubiquitous software. Even video streaming was generally smooth, though we did encounter occasional skips and slowdowns. Local videos played fine, including a 720 x 478 H264 file. MP3 playback was equally acceptable, though after three tracks of Hot Sauce Committee Part Two played through the small, predictably tinny speaker on the T408's back, we switched over to headphones. Casual, on-and-off usage gave us about two days of battery life. With more rigorous testing (WiFi on, video looping, and screen brightness set to 50 percent) we got five hours and 10 minutes before shutdown. That's two hours less than we got with the $300 version of the Archos 80 G9, another 8-incher. Turning off wireless connectivity -- as you might if,say, trapped on a WiFi-unfriendly flight -- didn't greatly improve things: we still managed just over five hours.